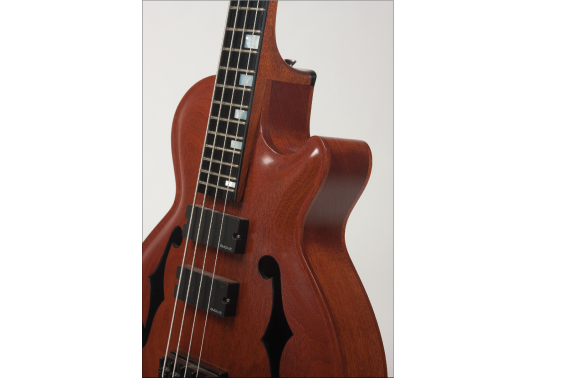 This Bass i s a 34″ scale instrument made of Honduras Mahogany and has hand carved top & back. The “F’ holes are bound with ebony. The pickups are EMG HZ. The volume and tone controls are subtly concealed on the sides of the Ebony & Wenge tail piece. The pickup switch is also placed on the tailpiece. 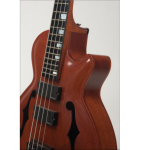 This bass guitar has a hand rubbed oil finish that accentuates the beauty of the wood grain and adds great playability to the neck.